It’s all about t’internet nowadays isn’t it? The whole world has moved online and, if you’re not online too, you’re nowhere, right? So why then, you might ask, do we bother with branches? With some predicting that purchases of certain categories of building products being over 50% online in the next four years; why would we pursue an aggressive branch strategy – and aggressive it is, with our opening of over 30 new branches this year alone? Of course, online shopping has its many and various virtues, and the point of this piece is not to denigrate it. It’s plainly marvellous, and transformed all our personal and professional lives. Yet there are certain things it can’t do as well as a ‘real life’ experience. So here are a few of our top reasons while it still pays to live in a ‘bricks and mortar’, rather than purely ‘clicks and mortar’, world. Retuning goods bought online can be a faff with some retailers – if there isn’t a real-life outlet to visit. Assuming that the vendor has been good enough to agree to the return and, better still, provide you with a free returns service (as we do if goods are undamaged and in re-sellable condition), there is still the hassle of packaging the thing back up and either arranging a collection and / or visiting the local convenience store to drop it off. Then you have to wait for your money back – around a week at least – and start the purchase process over again. If returning branch bought goods, you not only get your money back straight away, you can replace the offending item there and then. By which we mean: the purchase process is an immediate one. Want it, need it, see it, buy it. Not good being stuck on a job on a Saturday morning and running out of something: what good is Amazon or an overnight delivery to you then? None, obvs. Branch counters are always open until Saturday lunchtime and, dare we say it, sheds open on Sundays too. While the internet is calling for your attention – promotion this, click-bait that – the fact remains that what goes on in store stays in store. There are discounts, promotions and other offers that are only available to those showing their faces. Take our cash back deals for instance: buy over the counter, and we’ll give you up 10% cash back there and then. 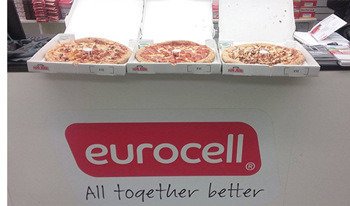 Not entirely dissimilarly, we celebrated National Pizza Day by bringing in loads of the Italian staple into the branches for our customers to nom on. Try that with your online account – assuming it’s not Just Eat, that is. Perhaps best of all, branches offer you personal service. 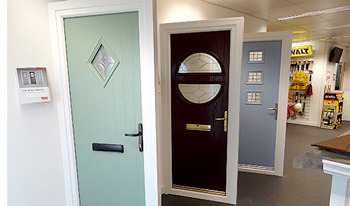 We know our products and ranges better than anyone, so are best placed to help you make the right choice. When it comes to our ‘core’ offer, we can assist with measurement, specification, site matters and so on. When the project demands, we can even provide people to visit the job for you and ensure everything goes swimmingly – especially on complex, multi-product, ‘multi-order’ jobs. Even if you don’t need that kind of high-level intervention – which we’re happy to provide – there will always be the occasion when you might have to approach the counter, produce a widget from your pocket and say, “I need five of these”. And we’ll know what it is, whether we’ve got any – or whether we can get one. So, come on in – the people are lovely. With over 170 branches across the country, it’s easy to call in and see us wherever your work takes you. No matter which branch you visit, you can be certain we’ll have what you’re looking for in a permanent stock of over 4000 top quality PVC-U products and accessories. All available to take away with you or for immediate delivery. And if you’re not sure what you need, our expert staff are always on hand with advice on choosing the right products for the job – whatever the job. Plus, you might get a pizza out of us too. 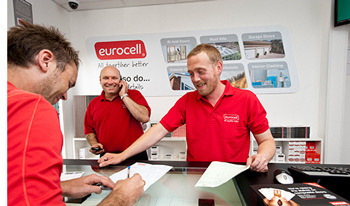 You can find your nearest Eurocell branch here. Plus, if you remain the kind of person who want's to continue shopping online you can, of course, browse and buy right now from our online shop.